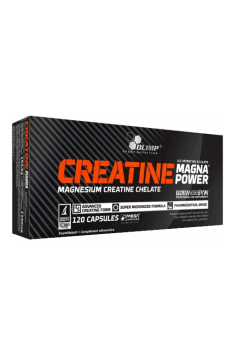 Olimp Creatine Magna Power is a technologically advanced creatine preparation in the form of MEGA CAPS® capsules containing the patented formula Creatine Magna Power®. It contains creatine in the form of magnesium chelate characterised by the highest possible bioavailability. Every serving provides 2,200 mg of magnesium creatine chelate, including 176 mg of magnesium ions. The supplement improves the capacity of the body during workout, thanks to which it can withstand harder and longer trainings. It promotes muscle growth, allows to reduce breaks between sets, and guarantees a higher-quality pump during strength workout. Moreover, it exhibits numerous health-improving properties within the digestive, nervous and cardiovascular systems, as well as supports the course of metabolic transformations in the muscles. Creatine is a tripeptide with a simple structure produced in the liver. It consists of two exogenous amino acids: arginine and methionine, and one endogenous amino acid: glycine. It is a protein found in many common food products but in negligible amounts. In order to benefit from high creatine levels in the body, it would be necessary to take at least 5 g of the substance daily. Because food contains only its very little amounts, even the best diet is not capable of satisfying the needs of a physically active body. The only reasonable method seems to be supplementation with preparations containing the substance. Along with a phosphoric acid rest, creatine is essential to the formation of phosphocreatine. The compound is an energy substrate that allows the transformation of adenosine-5’-monophosphate (AMP) and adenosine-5’-diphosphate (ADP) with fewer high-energy bonds to the form with three bonds, that is adenosine-5’-triphosphate (ATP). Why is it so relevant? ATP is an energy carrier in the human body. Every anabolic reaction requires energy, which is mostly delivered by none other but ATP. During heavy workout, ATP molecules are broken down to ADP and then AMP. The breakdown process releases energy from high-energy phosphates. In order to prevent a disastrous sudden drop in the level of available ATP, the body constantly replenishes its reserves by transforming ADP and AMP, provided it has enough phosphocreatine. Many scientific studies have proven the effect of creatine on the growth of muscle mass and strength as well as overall body mass. Creatine supplementation results in a higher ability of the body to keep working under maximum strain, which improves workout quality. Thanks to that, the musculoskeletal system is stimulated even more, which generates greater muscle mass growth. Damaged tissues are topped by new ones, which leads to muscle hypertrophy. In many studies, creatine has shown its surprising health-promoting properties and beneficial effects in the therapy of a number of ailments. The substance has a proven ability to slow down the process of neurodegeneration. Research also shows that creatine minimises the difficulty to focus caused by a lack of sleep. The substance has also been shown to combat depression by optimising energy management and improving motivation. What is more, creatine has proven useful in alleviating the symptoms of some digestive diseases, such as Crohn’s disease. Magnesium is a chemical element with a crucial role in the body. It is an activator of numerous catalytic enzymes connected with nutrient metabolism and more. It is an essential component of bones, cell membranes, and ribosomes. Magnesium helps to maintain proper electrolyte balance in the organism, that way contributing to proper nerve impulse transmission, and reduces the risk of swelling. It is also a crucial factor in the process of secretion and release of such hormones as insulin or catecholamines. Additionally, it displays cardioprotective properties and promotes haematopoietic processes. It is also a structural element of proteins participating in the process of energy transmission during the electron transport chain, contributing to the production of energy. The combination of creatine and magnesium in the form of magnesium creatine chelate Magna Power® is justified by the synergy of both substances. Magnesium is nearly as important in the reaction of ATP phosphorylation as creatine, as it activates catalytic enzymes that take part in the process. Delivered in the form of creatine chelate, it reaches muscle cells, where the processes of ATP breakdown and regeneration occur during physical activity. What is more, creatine in that form keeps its extraordinary stability and bioavailability. Thanks to magnesium, which has a basic pH, the breakdown of creatine to its inactive form, creatinine, is minimised, as the process takes place in an acidic environment. In summary, Olimp Creatine Magna Power® is a dietary supplement of supreme quality intended for athletes who want to take their training to a new level and enable their muscles to work even more efficiently, at the same time supporting many aspects of their health. Take 2 capsules 3 times a day, preferably on an empty stomach, before and after training or between meals. When using the supplement, make sure you drink a lot of water, that is about 3 litres daily. Otherwise, you might experience symptoms of migraine, especially during highly intensive workout. In order to amplify the benefits of supplementing creatine, try combining it with preparations containing L-citrulline or L-arginine, which further improve blood flow in muscles, or beta-alanine and caffeine, which increase endurance during workout. Filler - microcrystalline cellulose; anti-caking agent - magnetic salts of fatty acids; capsule (capsule components - gelatin, color E171).